Background: Ammonia nitrogen at high concentration poses several threats to the human and environment such as odor and eutrophication. Although many techniques have been studied for ammonia nitrogen removal, utilization of fruit wastes as natural adsorbent could offer some advantages such as low cost and spent adsorbent can be used as fertilizer. Aim: The performance of jackfruit (Artocarpus heterophyllus) seed adsorbent for ammonia nitrogen (NH3-N) removal from aqueous solution was examined through batch and continuous bed column experiments. The effects of sodium chloride (NaCl) and lignin concentration on the adsorption process were evaluated. Results And Discussion: The results revealed that the adsorption performance gradually decreased upon the addition of NaCl and lignin in the solution. 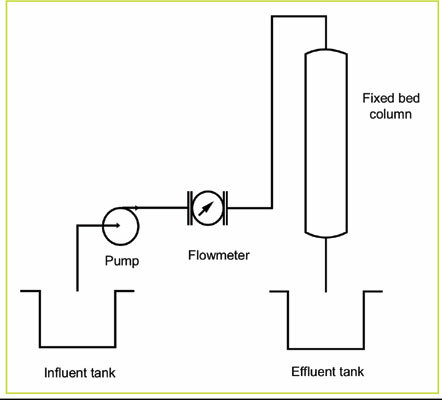 Fixed bed column experiments showed that maximum removal of ammonia nitrogen was obtained at an influent concentration of 100 mg/L, bed height of 10 cm and lowest inlet flow rate of 17 mL/min. Meanwhile, desorption studies were carried out at different pH and highest desorption capacity of jackfruit seed adsorbent was 0.42 mg/g. Conclusion: This study suggests that jackfruit seed is a promising adsorbent for the recovery process of ammonia nitrogen. Ammonia-nitrogen, jackfruit seeds, adsorption, fixed-bed, lignin, bed column experiments.